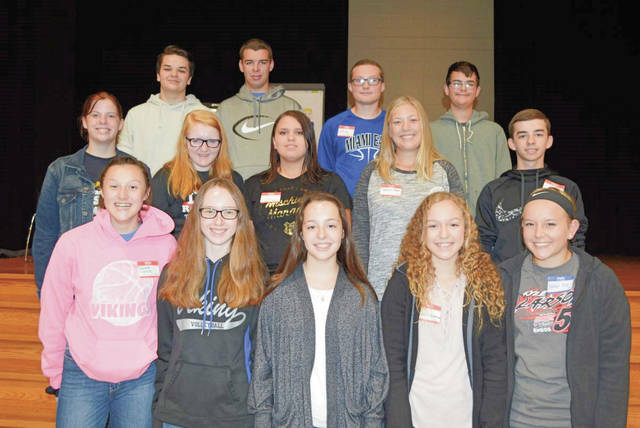 CASSTOWN — Fourteen first-year members of Miami East-MVCTC FFA attended the 2018 State Greenhand Conference	hosted by the Versailles FFA Chapter on Sept. 8. With a theme of “First Down and Life To Go,” the conference offered workshops for the first-year agricultural education students to learn about opportunities in the FFA, setting goals, developing communication skills, and working in teams. Additionally, attendees rotated through various Career Development Events that FFA participants can get involved in during their membership. Presenters for the conference included sessions by Ohio’s National FFA Officer Candidate Ryan Matthews; State FFA President Kolesen McCoy; State FFA Vice President Holly McClay; State FFA Secretary Gretchen Lee; State FFA Treasurer Kalyn Strahley; State FFA Reporter Bailey Eberhart; State FFA Sentinel Mallary Caudill; State FFA Vice President-At-Large Tyler Zimpfer; and State FFA Vice President-At-Large Grace Lach. This year’s program featured keynote speaker Dr. Dan Schroer, past National and State FFA Officer from Ohio and current superintendent at Springboro Schools, with a presentation focused on “The Key to Success.” The participants enjoyed the opportunity to meet FFA members from across the state of Ohio and learn more about FFA. Over 400 members were in attendance. In the canned food drive competition, Miami East placed second and earned beautifully decorated cupcakes. This is the third year ME FFA members have placed in the canned food drive.